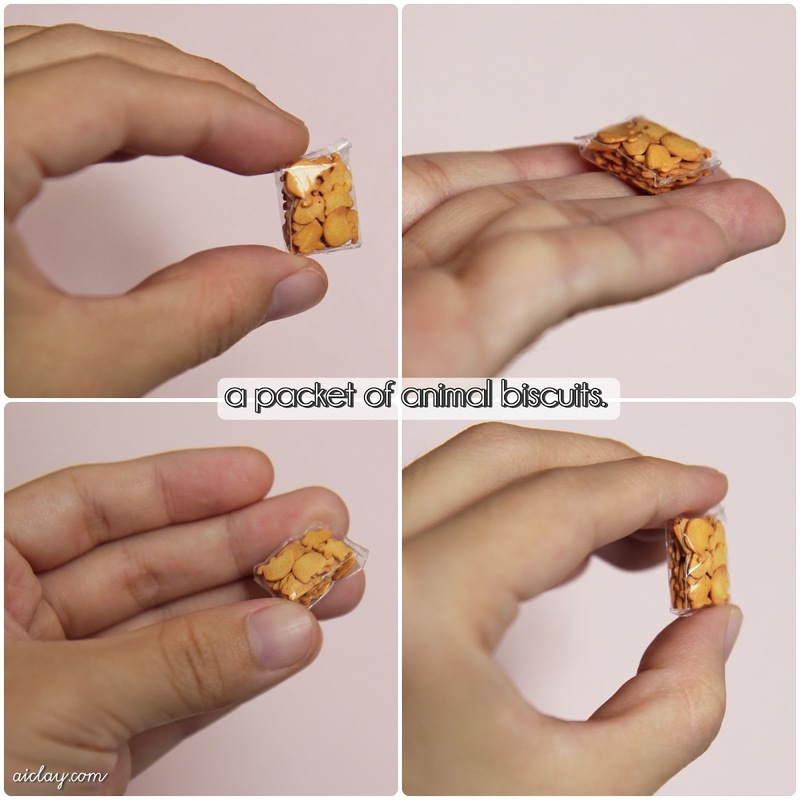 AiClay - a Haven of Miniature Food: how to break fast & photos from Mother's Day. I don't know if that's the official meaning behind the word 'breakfast', but it sounds pretty logical as it is the first meal we take after a fast of 6-8 hours (when we're sleeping). So I often take advantage and eat as much as I can hahah I'm such a pig. I even vaguely remember that whatever we eat within an hour of waking up contains only half the calories it actually has. Don't ask me how it works, or if it's true. It's just a comforting thought while I'm scoffing down all that bread and eggs and what-not. So when you think breakfast, you got to think of PANCAKES! It's such an English food (erm don't quote me on this as well), but Mcdonalds has spread the culture of eating pancakes for breakfast all around the world, so yup we Asians love them too! This pancake pendant is sold out in the store right now, but do check back as I'm hoping to make some again! 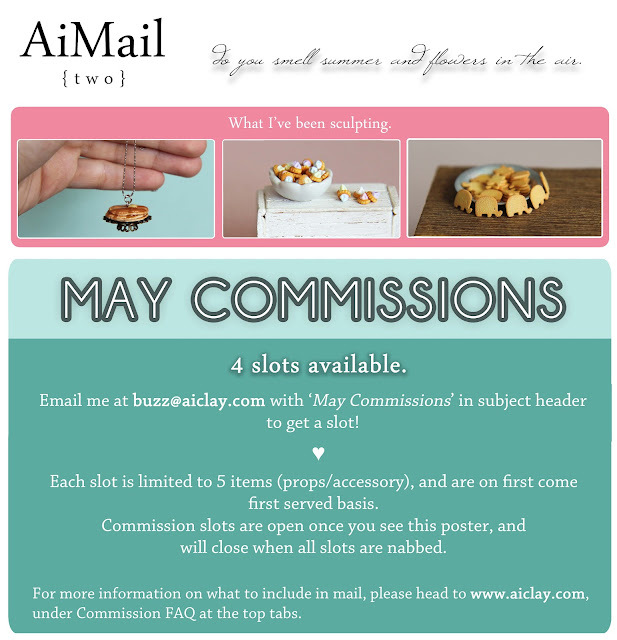 Today, I also sent out the second issue of AiMail, and also announcing the official opening of May Commissions! Visit the FAQ tab on top to find out how you can nab a spot! So Mother's Day just passed, and here are some photos of how my family spent it. We went for Japanese lunch earlier in the day. My brother and I were treating (my father got lucky since it isn't technically his day hahah!) so we asked my mom to order anything she wanted. 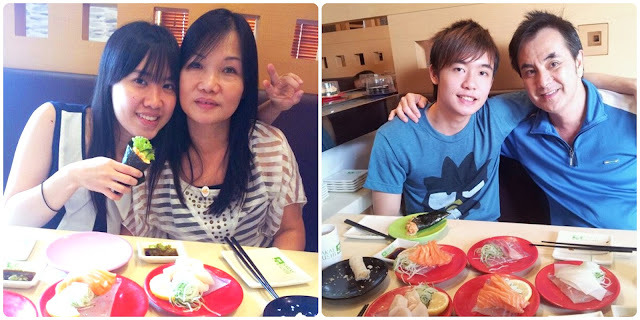 And we had loads of sashimi with chawanmushi (sweet cooked egg), came with a heavy price tag in the end but hey, it's Mother's Day. My mom looks tired in this photo, must be weary from the anticipation of what we kids had up our sleeves haha. After lunch, we sent the parents together with my aunts and uncles for a surprise karaoke session (yes we Asians are big on that!). And the children gathered in my cousin's house and got busy in the kitchen, as we had to whip up dinner! I prepared Vietnamese spring rolls, and it was a bit of a failure as I had prepared the filling the night before and left it in the freezer. On the actual day itself, the filling refused to defrost and I was left with a huge chunk of cake-like filling. My cousin had to stir-fry the filling in the end, before I could wrap it in the rice paper and fry them in the pan. They tasted not too bad in the end, on hindsight I should have bought more prawns and meat though. -writes down notes for next year's Mother's Day. And don't stop showing your love for your mom just because Mother's Day is over! Enhorabuena por esa mama tan guapa que tiene y por tu maravillosa familia. thank you Ascension, always lovely to have you in my blog! ♥ Hope you had a great celebration!